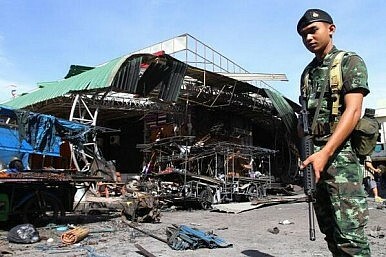 Malaysian negotiators and Thai rebels want to stop regional bloodshed by the end of next year. The violent political upheavals in Bangkok have all but scuttled efforts to find a peaceful solution to the conflict in the south where about 6,000 lives have already been lost from an independence rebellion waged by Islamic militants. However, Malaysian negotiators involved in the latest peace talks said they were hopeful a partial ceasefire by the Barisan Revolusi Nasional (BRN) rebels could be attained at some point in 2015. The highly-secretive BRN has conducted a vicious terrorist campaign in the three southern provinces of Yala, Pathani and Narathiwat since January 2004, targeting teachers and government officials for assassination and deploying deadly roadside bombs that have proved effective in killing police, military and civilians living in the area. Those provinces were ruled by Muslims as independent sultanates until 1909 when they were formally annexed by Thailand. A quest for independence was never totally quashed and this escalated sharply in 2004 when former Prime Minister Thaksin Shinawatra declared martial law and branded the rebels as the local front in the War on Terror. Women and children have been a target of the violence. Two weeks ago police said suspected Muslim rebels had killed four people, including a nine-year-old boy, adding the attack may have been a reprisal for the earlier killing of three Muslim boys. Another two Buddhist women were gunned down and set on fire in two separate attacks. “The whole idea was to push for cessation of hostilities and to reduce the violence,” Ahmad said. Thailand followed a lead established by the Philippines and enlisted Malaysia as a “facilitator” early last year after recognizing that Muslim insurgents in its troubled southern provinces did indeed have grievances that were worth addressing.